I’m really glad I decided to try the CSA, although I only did it for 5 weeks, I still received plenty of fresh and local vegetables, fruits, and herbs. It was also cool to try things I never heard of before like sorrel and kohlrabi. When I was in Portland, one of the dinner specials at the Grill Room was a steak served with kohlrabi. And I thought HEY! I know what that is!!! One thing I’m very nervous about is, making my own recipes! I always refer to cookbooks or recipes I find on pinterest, but with the CSA I slowly started experimenting with their ingredients to make my own dish! I hope to continue that trend and keep trying to create my own meals! 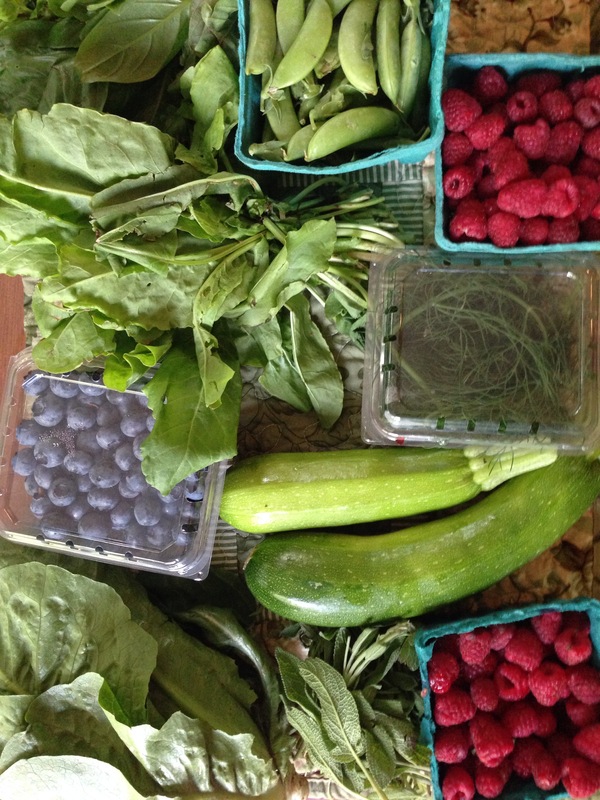 For the final week I received raspberries, snap peas, dill, basil, blueberries, sorrel, and zucchini, and lettuce. Since this was the week before leaving for vacation, I didn’t use too many of the items for dinner. Instead I snacked on the raspberries and blueberries, used the lettuce on my sandwiches, and made pesto. Grilled snap peas. Ummm I love these! Grilled zucchini – seasoned with olive oil, salt and pepper.